A wee collaboration between Kit Lane and me, a few of her fabulous 'Bobs given some stitchy love from me. She'll be unveiling these in her shop this afternoon. The yellow one was encrusted with knots and stitches, all of dyed by me with materials from my woods. The pink one seemed to long for something a little more quirky. 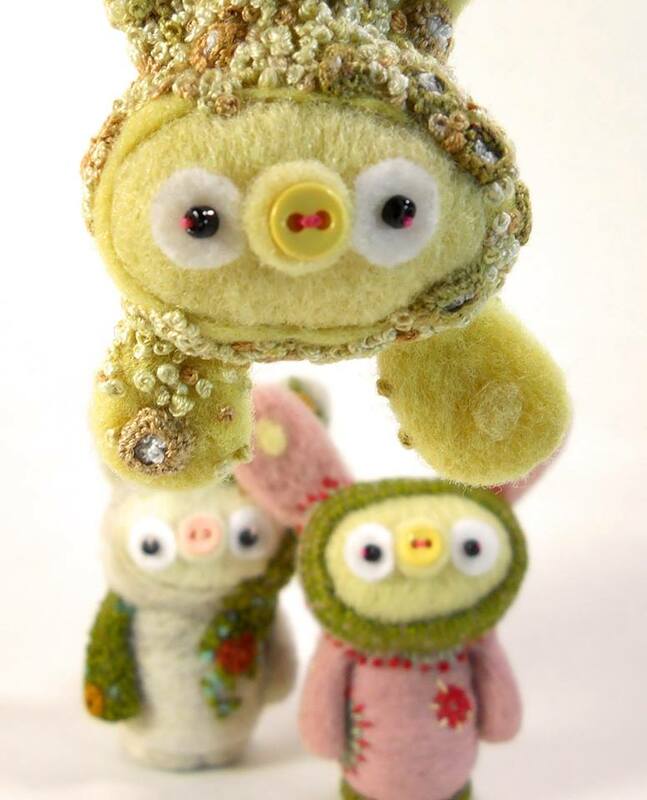 Kit does wonderful work from these squee-inspiring Jacabobs to her sculptural pieces (and Jabba, we can't forget Jabba) and has a dedicated following. I'm thrilled to have been able to collaborate with her. If you're interested in owning one of these pieces, keep your eye on her shop. They should be there some time this afternoon. The bobs are adorable, and the collaboration is exciting. I was annoyed at Kit's Etsy bio, though. I swallowed line, hook and sinker! Y'alls work is perfectly suited together!